Sales At Ad-A-Print: Custom Embroidery Ladies Breathable Shirt. Today's Port Authority ladies pinpoint sure this is the greatest polo shirt I got right now meshed nature breathable and it's only 6.5 ounce so you get little bit of a heavyweight but so breathable you won't believe it and that's what you relax when you wear is got for button plaque it's a great lady shirt for a stylish white on the inside with the white trim or you get it with the other colors of the blue with a navy trip it's a gorgeous shirt have even seen there red with white . That shirt shirt for everyday work feeling comfortable relaxed need always looking sharp this today only at $27.98 with the left chest embroidery that's only special that's a $50 savings only 2798 with the left chest embroidery only today May 2. Minimum 6. 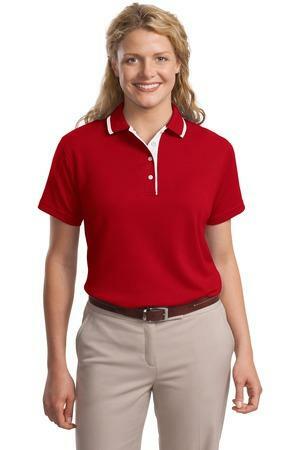 Comfy and soft, this polo has a special mesh knit for breathability. Easy to care for, this shirt retains its neat, crisp look day after day.